Planning for the installation of a privacy fence requires some prep work. 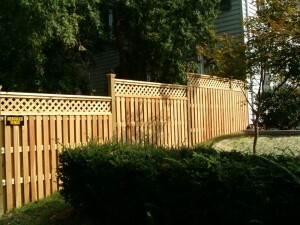 Privacy fences are a great option for homeowners for a variety of reasons. They are perfect for anyone looking for some added security for their property and can provide protection against nosy neighbors. A privacy fence can make your backyard seem like your own private island, but they also require a little bit of prep work before they can be installed. Here are a few things you should do in order to prepare your property for a privacy fence installation. Different municipalities have different regulations regarding privacy fences, so you’ll have to do some research to determine what sorts of requirements yours will have to meet. Often, permits will need to be obtained and these costs are generally not thought of when a homeowner estimates the cost of installing a privacy fence. It’s worth checking your local zoning laws and having your property surveyed to determine your property line before committing to a fence project. If your property does not already have a fence, you’ll need to mark the utility lines on it before having your new privacy fence built. Call 811 to get in touch with your local utility companies and ask them to mark the utility lines on your property. When the fence project is all planned out, it will be time to choose the material your fence will be made of. Wooden fences are generally the most popular material because they are highly customizable – however, they also require regular maintenance to ensure their longevity. If you want a more low-maintenance option, vinyl would be a great idea. While these fences tend to cost more than wooden ones, they require next to no maintenance and are built to last. Keep in mind that your new privacy fence is an investment, so consider the future costs of maintenance in addition to the upfront installation cost when choosing your material. This entry was posted on Thursday, January 26th, 2017 at 8:51 pm. Both comments and pings are currently closed.